Cockroaches. Nasty black creatures. The last thing you want in your home and that you’ll try everything to get rid of. Not that you’ll be wanting to do that to the cockroach in A Cockroach and Furry Blurry Fluffy Things by Team Furry Tails, a group of young Taiwanese theatre students. This roach is a sad and lonely creature who finds herself in a strange land. Back in Taiwan, she climbed into a box of pineapple cake (clearly a roach with good taste), which promptly got shipped to London. Crawling out of her hiding place, she meets a host of local creatures in what is a charming, sometimes funny, and very cleverly staged show. 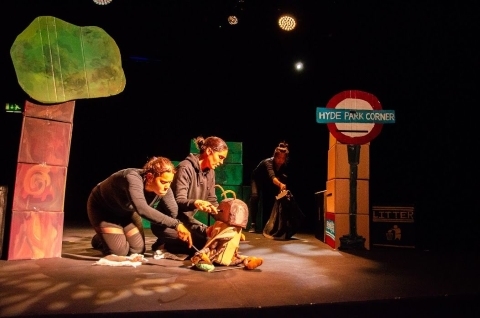 Using several types of puppetry, director Huang Yu-chia, designer Chiu I-Hsuan (both currently studying in London) and dramaturg Liu Meng-ying Liu (studying Children’s Literature at the University of Glasgow), and lighting designer Chen Yun tell the story without dialogue. It is all delightfully low-tech. The cockroach appears in several forms, best of which is the largest, which has very detailed legs in particular. It’s very human-like and you will find out just how much can be said with a turn of the head and a couple of beady eyes. Part of the charm comes from the fact all the puppets are made from everyday things. There is absolutely no reason why you and your children couldn’t go home and try things for yourselves. Among the characters our cockroach meets are a bird, cleverly done with a feathered umbrella; a cat, a very enthusiastic waggy-tail dog and a fox; and my personal favourite, a squirrel who befriends our insect traveller and takes her home. They are all so engaging you barely notice the puppeteers. The set is a delight. Cardboard boxes are at first precisely that, but all with hand-drawn logos of well-known Taiwanese food brands (I-mei appears quite a lot). These later transform into a red telephone box (how does a cockroach react when hearing a British phone ring? You will find out! ), underground signs, a litter bin, Underground signs and, finally, blocks of flats. Hsu Li-wen’s light and catchy music plays through the show, changing mood according to what’s happening, sometimes the music is gentle and always upbeat. If you’re looking for deeper meaning, I guess it’s all about friendship and being accepted in a strange land. But really, it’s a simple story, imaginatively told. Just let your own imagination run for half an hour or so. You won’t regret it.